With 2009 ending and 2010 arriving, I decided to take a look back at how my life changed during the decade. Now, I want to hear from you. 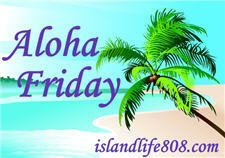 My Aloha Friday questions are: How has your life changed during the previous decade? What are you looking forward to in the coming decade? The previous decade? My children have become men, I lived through a massive stroke and we lived in 3 states. I look forward to seeing my children go to college and then see what they do with their lives. Well I have 2 more children, I’m now married, I am now a sahm instead of working 50+ hrs a week. We are now home owners and found blogging saves my sanity. Giving birth to Kaila was definitely the highlight of 2009! In the past decade we moved into a brand new house, had 2 grandkids and my daughter told us she is pregnant with her first boy, due in April! We had twins, got married, bought our dream house, started our own business, went on many many many vacations…we look forward to changing peoples lives in 2010! I am a musician, and I lost my band. It was very difficult to find new musicians that blend together. I went through quite a few, but I have a great bunch of guys now, and we would like to take our work out on the road soon. I also would like to get my own originals noticed. .-= themoodymix´s last blog ..ALOHA FRIDAY =-.